If ordinary bank ATMs can be made secure and reliable, why can't electronic voting machines? It's a simple enough question, but, sadly, the answer isn't so simple. Secure voting is a much more complex technical problem than electronic banking, not least because a democratic election's dual requirements for ballot secrecy and transparent auditability are often in tension with one another in the computerized environment. 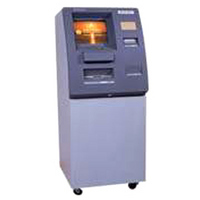 Making ATMs robust and resistant to thieves is easy by comparison. Yes, and Lyndon Johnson stole a Senate race by ballot box stuffing back in the days of all-paper ballots. But that doesn't change the simple fact that it's far easier to fiddle results with paperless electronic machines than it was with paper ballots. Or that an ATM failure tends to be very localized and limited, while voting machines can be hacked in bulk. Or that the results of a failed election can be an unnecessary war, more than 4,000 U.S. dead, a million others dead, quadrupled gas prices, $40+ trillion in debt, peak oil without deployment of solar and wind, environmental crisis near or beyond tipping point, and need I go on? At what level of demonstrated risk does it become obvious that waiting for perfect voting machines isn't the right answer? Fortunately, some states have gotten the point already. The forest service's reasoning is simple: sell trees to loggers, use the money to clear areas of potential fire fuel. What the loggers cut can be potential fuel. With one sale, a fire hazard can be removed and the agency paid so it can remove more fuel.